Opposite Porte de Versailles exhibition centre, this 4-star eco-friendly residence offers a 24-hour reception and is only 3 km from the Parc des Princes Stadium. Free optic WiFi is available in all areas and extra features include a garden patio. An LCD TV with satellite channels features in all of the apartments and studios at Aparthotel Adagio Porte de Versailles. Most of the accommodations have an adjoining balcony. A buffet breakfast is served every morning and children from 4 to 11 years old can enjoy it at a reduced rate. There are also vending machines in the 24-hour reception. 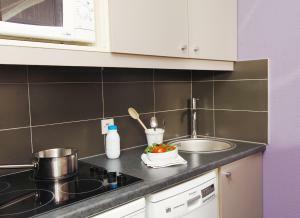 Alternatively, meals can be prepared in the accommodation’s fully equipped kitchen, which is complete with hotplates, a microwave, refrigerator and freezer. Private indoor parking is available on site according to availability. The property is an 8-minute walk from Porte de Versailles tram and Metro station, providing direct access to Montparnasse and Place de la Concorde. Parc des Princes Stadium is only 3 km away while the Boulevard Périphérique is just next to the residence. Please note that upon check-in guests will be requested to show a photo ID and a credit card. The details of theses cards must match the reservation's holder ones. A baby kit (cot, high chair) is available on request according to availability. Bed and bath linen is included in the room rate. For stays of 8 nights or more, a weekly housekeeping service is included. For stays up to 7 nights, optional housekeeping service is available upon request and at an extra cost. 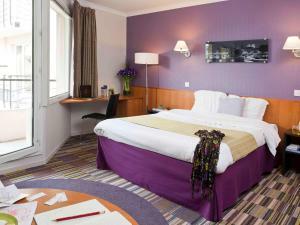 At an additional cost, guests can request their bed linen and towels to be changed. At an additional cost, guests can request a full housekeeping service. Breakfast is not included and costs € 11. Please note that a pet can be accommodated with a € 10 extra fee. This elegant accommodation offers a flat-screen TV with satellite channels and an equipped kitchen. The private bathroom features a bath and a hairdryer. Rate: € 89.75 ... € 356.00; select dates below to get current rates. This elegant accommodation features a flat-screen TV with satellite channels and an equipped kitchen. Its private bathroom features a bath and a hairdryer. 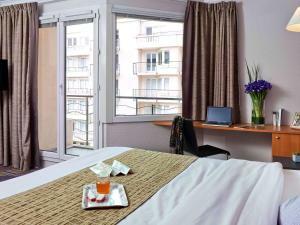 This elegant accommodation is composed of 2 rooms and offers a flat-screen TV with satellite channels. Extra features include an equipped kitchen and a seating area. It has a private bathroom with a bath and a hairdryer. This studio features a balcony, dishwasher and microwave. Rate: € 113.30 ... € 202.84; select dates below to get current rates. This studio features a tea/coffee maker, dishwasher and flat-screen TV.